Each of us can probably remember having to deal with a particularly difficult teacher in high school. Perhaps we didn’t like the subject (for me this would be math or science), or maybe we found the workload excessive. Sometimes there were just personality conflicts with individuals whom we found to be harsh or overbearing. If provoked, we might, in a fit of pique, get worked up enough to say the wrong thing to our nemesis, which, if we weren’t careful, might land us in detention, or cause the teacher to have us killed. What’s that? You can’t recall any instances of teachers in your high school putting out a contract on students that angered them? Well then, you were just in the wrong high school. Incensed, the boy’s mother removed her son from the school and then filed a police report on October 12, resulting in Forde’s subsequent arrest and release on $10,000 bond. This, in turn, forced the school to remove Mr. Forde from the classroom (I guess being arraigned for conspiracy to commit murder is the triggering mechanism for intervention in Georgia public schools). Forde’s attorney now says it was all a joke. Funny guy, that Mr. Forde. Funny guy. 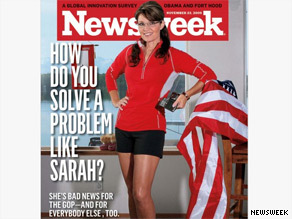 "The Next President of the United States..."
Apparently, Palin posed in a skimpy running outfit for Runner’s World magazine, from where it was lifted by Newsweek. While it’s true that Newsweek was looking to make a statement by their choice of this photo, I’ve grown way past tired of hearing Sarah Palin disingenuously complain about being dealt with less than seriously by the media. A year ago Palin could be granted an ignorance pass, but no more. If she wants to be taken seriously, she should appear on Meet the Press and Face the Nation, not Oprah. And when discussing economic policy differences with the President, she should stay away from silly-sounding comments such as: Obama has a “…backassward ways of trying to fix the economy.” Before you can sit at the grownup table, Sarah, you’ve got to be able to act like a grownup. I know that just about every Ravens fan was relieved yesterday to learn that Steve “Wide Left” Hauschka had been released, but I feel terrible for him. As angry as I was when I saw his kicks sail outside the uprights, watching him walk back to the bench alone and then sit there staring at the ground, knowing that his dream was falling apart in front of his eyes… well, for me that was just heartbreaking. I suppose Hauschka knew that he was finished in Cleveland Monday night; I just can’t imagine having to continue playing, showering and dressing (without having the heart to celebrate a win) in the locker room, and then the long trip home – all the while knowing that you’re about to be fired. And then, to add insult to injury, the team’s fans dance on your grave. 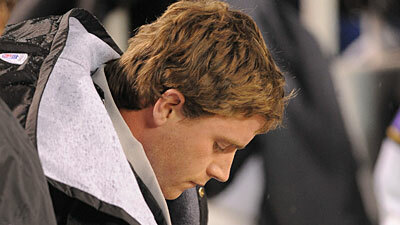 Good luck to you, Steve Hauschka. WordPress is the host, so I hope not.